Welcome to Reveal Day 3 for our July Release! This month we are celebrating the FOUR year anniversary of our company! That means an extra big release with new stamps, new dies and new stencils! If you missed the stencils, make sure to pop over and check out our reveal post from Monday here! 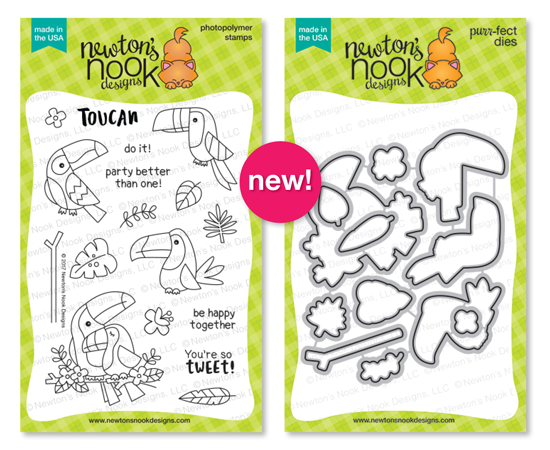 Today we are revealing our adorable new Toucan Party stamp set and coordinating die set. We are also giving away a $20 store credit each reveal day to one lucky winner so make sure you read all the way to the bottom of this post to see how to win!! 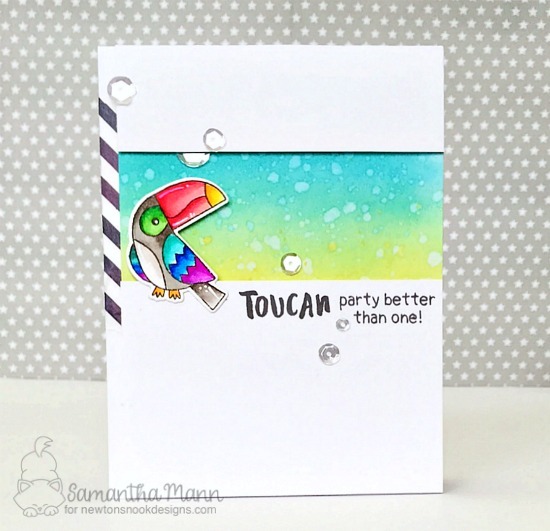 Party with some delightful toucans in this 4 x 6 stamp set! These feathered friends will be so much fun to color for tropical summer cards! 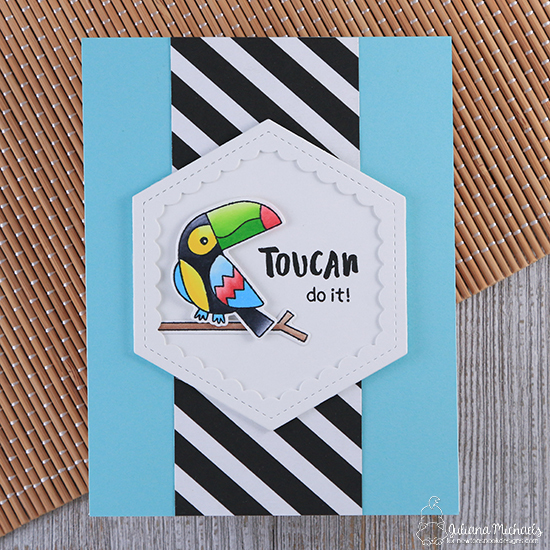 Mix the large "Toucan" stamp with the sentiments to create "Toucan do it", "Toucan party better than one", and "Toucan be happy together!" The fun tropical leaves and flowers help create cheerful tropical scenes! Head to the tropics with these adorable projects from our Design Team! 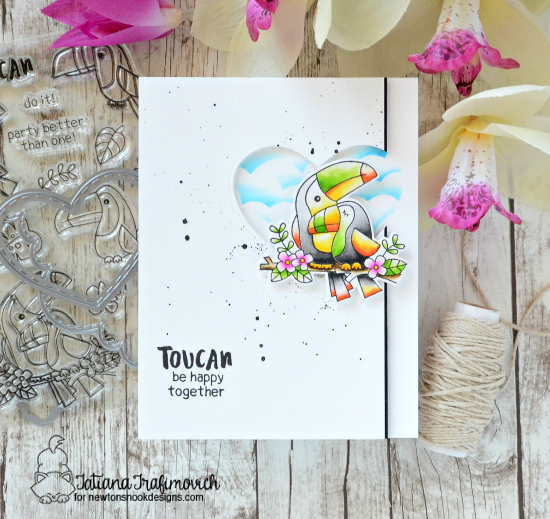 Amanda created this awesome tropical card using Toucans in two corners from the new Toucan Party Stamp Set! She colored them in vibrant colors and layered them with leaves and branches cut out using the coordinating dies. She also created a fun background using our new Tropical Leaves Stencil! This bright bold card by Juliana is so fun! She used a single Toucan on a branch colored in bold colors with the "Toucan do it" sentiment! The black and white stripes really give it a fun modern look! 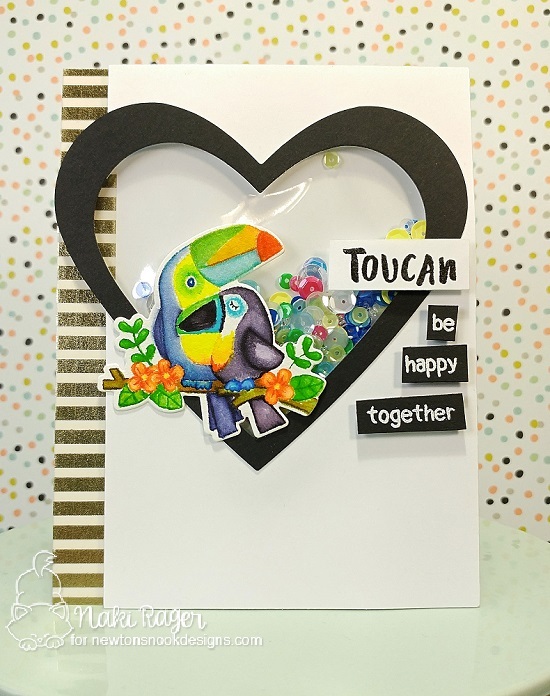 Larissa created a gorgeous background using our new Tropical Leaves Stencil for her card base. Then she layered the image of the cute Toucan couple along with lots of flowers and leaves cut out with the coordinating dies. What a lovely tropical scene! 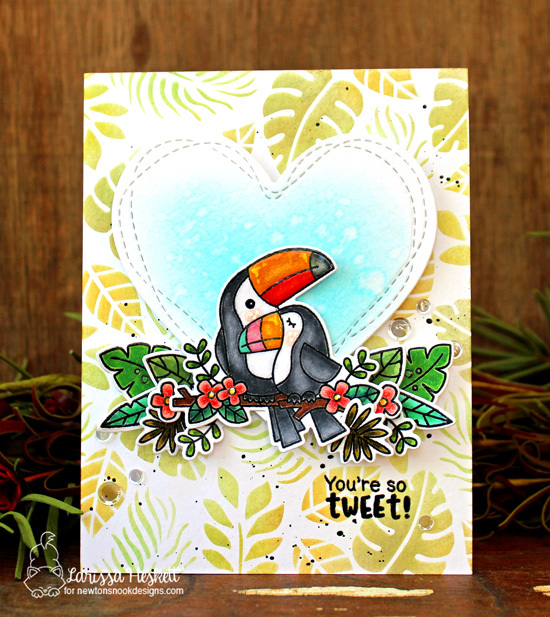 Samantha created this cheerful toucan card! She colored the toucan in such fun vibrant colors and made a fun ombre inked stripe to go behind him for an extra pop of color! This colorful shaker card by Naki would be perfect for a cheerful anniversary card! She use the Toucan couple from this new set and colored them using bright colors and the no-line coloring technique! The way she broke up the sentiment onto little black squares is super cute too! This little square card by Jennifer is so cute! 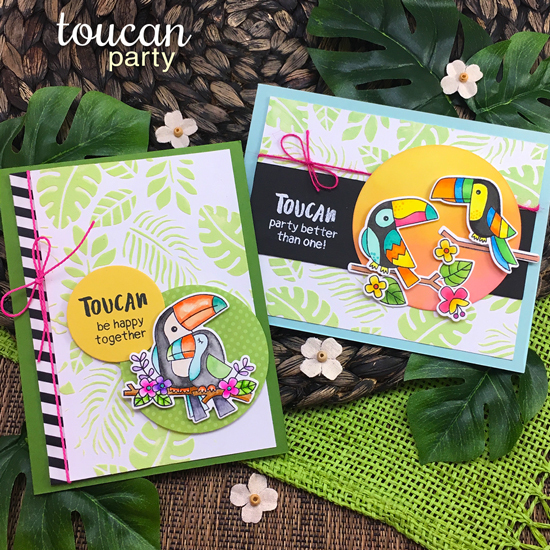 She used our Tropical Leaves Stencil to create a fun background for the sweet Toucan and leaves from the new Toucan Party Stamp Set! This would be a great card to send for cheery encouragement to a friend! 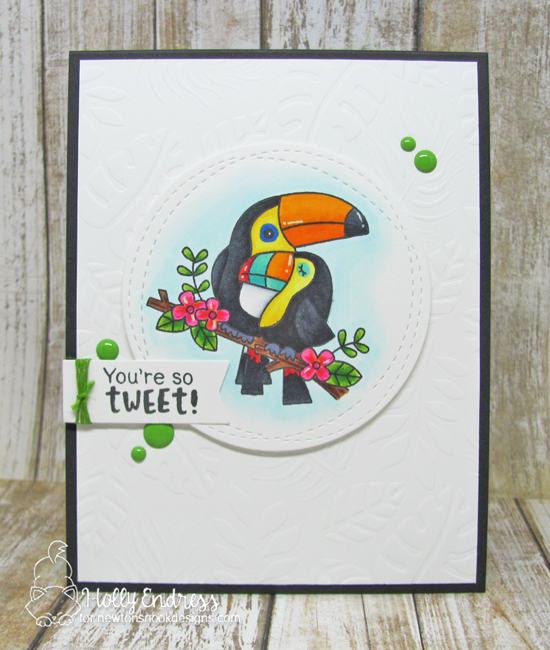 Holly created this delightful tropical card! She used our Tropical Leaves Stencil to create a subtle embossed background (you can see how she did this in her video here). Then she added that cute toucan couple colored in fun bright colors! This card is so TWEET! 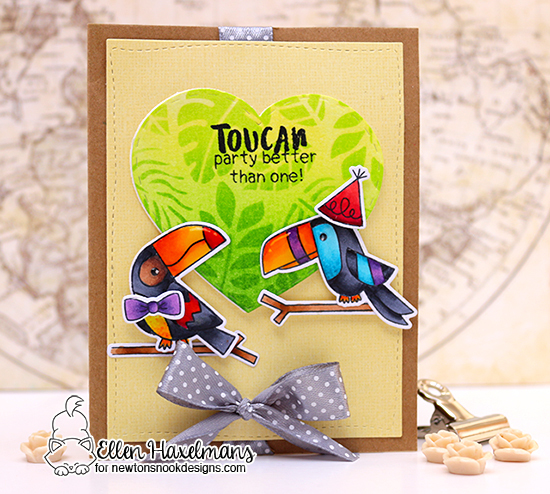 The toucans on this card by Ellen are ready to party! She used the Toucans from the new Toucan Party Stamp Set and added on a party hat and bow tie from our Pug Hugs stamp set to dress them up! She also created a fun pattern on the heart in the background using inks with our new Tropical Leaves Stencil! This adorable card by Tatiana is so sweet! She used the toucan couple from the Toucan Party Stamp Set and colored them in beautiful bright colors. Then she cut out the heart behind them using the heart from our Darling Hearts Die Set and created the clouds inside it by masking clouds created with our Sky Borders Die Set! Love these toucans! So fun and topical. They go great with the leaf stencil. Beautiful cards! OMG! Love all the cheerful and bright card with a tropical feeling!!! This stamp set is super fun and absolutely adorable!!! 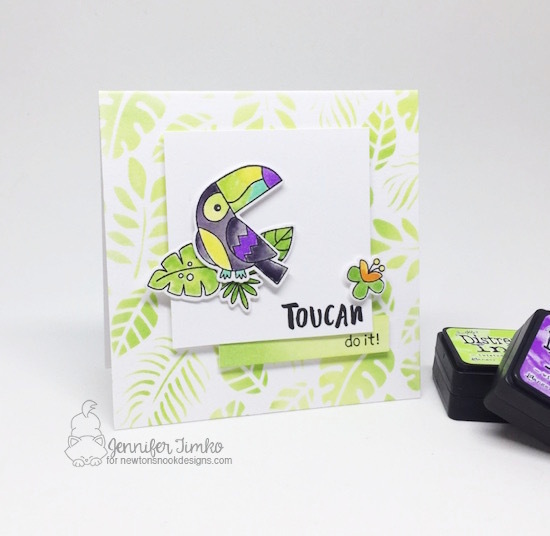 Gorgeous designs, I absolutely love these Toucans, such a fun stamp/die set! These tropical toucans are just so fun and are perfect with the leaf stencil. Gorgeous cards again from the talented DT. These toucans are delightful, especially when they're paired with that pretty tropical leaf stencil. Awesome samples! Love the cute toucans! They tie in so well with the Tropical Leaves Stencil too... a great combo! I'm in love with the darling toucans! Thanks for the amazing design team inspiration. This set is a definite must have! These are stinkin adorable Toucans! Love these cute and colorful Toucans--they make me smile. This is summer fun at its best! Amazing ideas for use the stamp set. Such marvelous cards - beautifully colored and they shimmer and shine and burst with creativity!! Happy 4th to Newton's Nook ... this release is my favorite yet! Congratulations to Newton's Nook...great cards! What a fun set that is near & dear to my heart. I am a birdie lover! The Toucan is so fun to color; birds can be so many colors. Awesome cards by everyone. Love your designs! These look so fun ... so bright and cheerful! Love those colorful toucans, especially paired with the new stencil! Fabulous sentiments for this set! The toucans, are my favorite of this realease. Such a creative stamp set! Love it and everyone's creations too! Ooh I love the Toucan, the DT's did an awesome job!! I love toucan's. They are so colorful. Gorgeous set, and the cards are amazing! Beautiful set! It has so much summer in it. Sweet set. Amazing DT cards. Love these toucan stamps. So tropical. Love these toucans!!! So cute! Awesome and colorful cards for an incredibly beautiful bird !